Now we will consider a Carpenter's Square with one external liberty. This generally limits the number of options available to the attacking side. 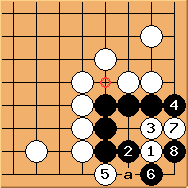 For example, Diagram 3.5 and Diagram 6.3 would stop working for white. is now the only valid attack. 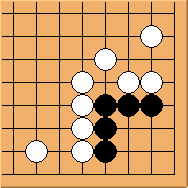 Black is able to simply play . With , no longer works as black has one more liberty even without an eye. is the proper adjustment. The result is a ko fight. Note that cannot block at 'a', otherwise would kill the corner in Bulky Five. 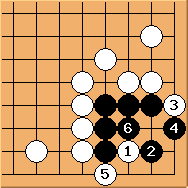 Of course black may continue to use attachment, the standard Carpenter's Square solution, which results in a ko fight that one can argue is slightly better than Diagram 8.3 - if black wins the ko there is some extra yose benefit. With the extra liberty outside, white no longer has the option to start attacking from . 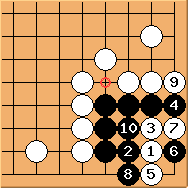 For example, this diagram shows that black can play now to save the corner. no longer works either. bend is now possible. To summarise: the extra liberty serves to limit white's options but also simplifies the situation. 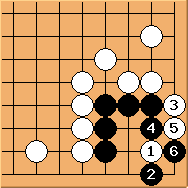 If white plays properly the result is still a ko fight. 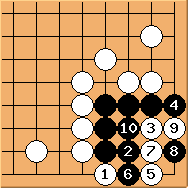 Note that many variations involving Eye vs. No Eye capturing race (such as Diagram 3.3, 4.3, 4.8, 4.9, 5.5, 6.6) would result in black's favour.